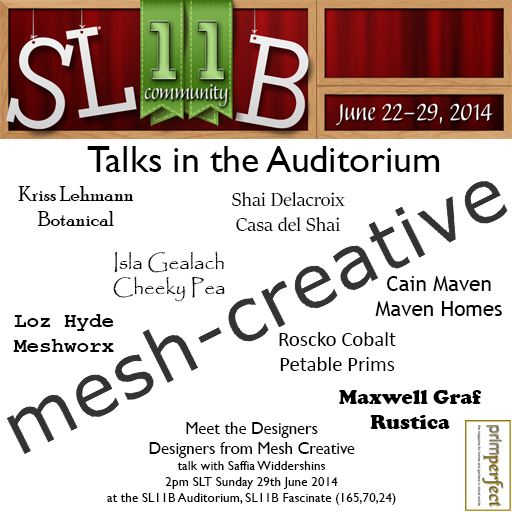 Prim Perfect talks today at the SL11B Community Celebrations: Mesh Creative and Fantasy Faire! Today, Sunday 29th January, we are delighted to have two fantastic two sessions of Meet the Designer, and then Meet the Community Talks in the Auditorium on SL11B Fascinate (on Stage 2). First of all, at 2pm SLT on Stage 2, back by popular demand, the team of leading Second Life designers that is Mesh Creative. They will have hints, tips, information and ideas – not least about keeping Second Life going while eagerly anticipting the new grid. Sadly, our 4pm Meet the Artist talk has had to be cancelled. 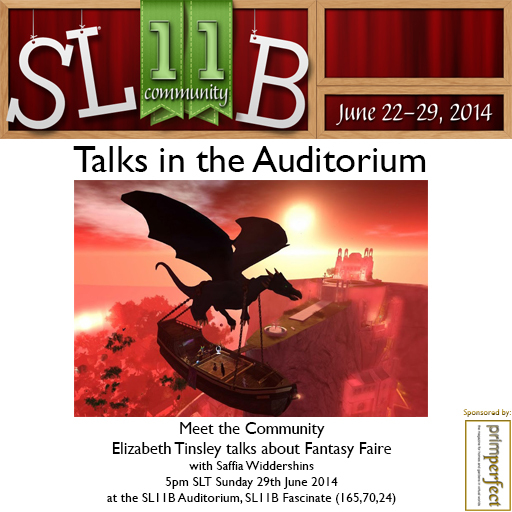 But at 5pm SLT on Stage 2, we will be talking to Elizabeth Tinsely of Fantasy Faire, who will be talking about the ways in which Fantasy Faire has grown from an idea into and event and now a community. Fantasy Faire is one of the most loved annual events of the Second Life calendar (rather like the Birthday) so come along and find out all about it! Previous Post: Designing Worlds explores Flotsam – and enters the amazing world of Aley – now on the web!